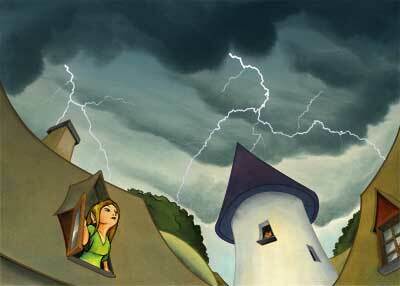 Another illustration, completed for the first Princess Samantha book: The Return Of Knockturnia. With this illustration, we went through our usual process of sketching, colouring and then adding the line work, but here aside from our usual clean up process of caching any stray colour bleed or rough edges, we added quite a few lighting effects using Photoshop. The added effects really breathe life into the lightning.